The official trailer for Harmony Korine's Spring Breakers is finally here. Since its festival premiere, we've been teased with leaked photos and movie clips, making us want more. "I liked the idea of the film as a social experiment," says Korine. "It was like there were two movies—the actual movie, and then the one that the media, paparazzi, and the people tweeting photos were also creating." Set to hit theaters in March, Korine’s take on spring break will definitely bring us back to our wild(er) days. 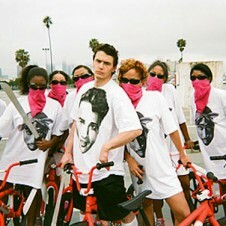 Though we were never lucky enough to party with James Franco. Watch Franco and his bikini-clad foursome get into some serious heat in the Spring Breakers official trailer below.